Carmen DeSousa: It's here... Cover Reveal for new novel, ENTANGLED DREAMS. Plus... you can sample the first three chapters. 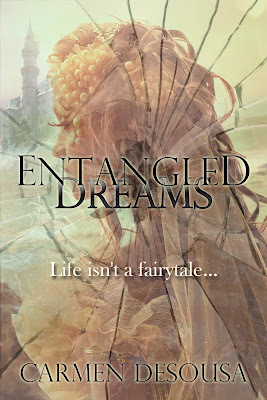 It's here... Cover Reveal for new novel, ENTANGLED DREAMS. Plus... you can sample the first three chapters. Nicky had just pulled into her assigned parking spot and reached for her gym bag when her cell rang. She looked at the caller ID and her eyes filled. “Hello, Lilith,” she choked out. She swallowed her tears, refusing to let her stepmother hear her cry. Home. Did it matter? She knew there was only one reason Lilith would ever call her. “Is Dad—” She couldn’t make her lips continue; he couldn’t be gone. “I’m sorry,” Lilith started, and to Nicky’s amazement, she actually sounded sincere. “Your father had an accident last night.” The woman—who should have been a mother to her—paused, allowing the words to sink in it seemed. She dropped her head onto the steering wheel of her car and wept. What difference did it make? Her father and she had barely spoken in the last six years anyway, ever since she’d moved out of that ridiculous household he called a home. Still, she loved him; he was everything to her. She wished she could have broken through his tough exterior and shown him that she still loved him despite the years of neglect. But every time they tried to talk, they fought. He hated her boyfriend, wanted her to move back home, wanted her to do more with her life. As if he was someone to talk. Yeah, her boyfriend was pathetic, but he’d been there for her for the last six years. He would change eventually, he would improve, and then everything would be better in her life. Her stomach plunged at the thought of moving. She didn’t want to go to work; she didn’t even want to get out of the car. She didn’t know how she could possibly endure the evening, but she needed the money. Saturday night was a moneymaker; she couldn’t afford to pass on the couple hundred dollars she could make on a weekend night. Besides, if she didn’t make enough tonight, she wouldn’t be able to pay the rent. Jonathan wasn’t home when she stepped inside their small apartment, so he wouldn’t be able to drop her off at work. That was good. It meant he wouldn’t be able to forget to pick her up afterward either. Joey from work, she thought internally. She wondered what kind of work her boyfriend was doing this week. Not wanting to fight about the car, she sighed. “My dad died last night.” The tears she’d been restraining poured freely. Thankfully, she wore waterproof mascara. Couldn’t work without it. There was nothing else to say. He couldn’t argue with her, and she knew he wouldn’t anyway. They had been dating for six years, basically, since she was sixteen. Their on-again, off-again relationship was almost comical. Comical to everyone else that is. She didn’t have that good of a sense of humor. They were more like roommates. Her dad was correct; Jonathan was a loser. And unfortunately, he didn’t have many prospects of getting better. She knew she should dump him, but he’d been there for her when nobody else had. “What are your plans?” she inquired lightly, knowing they were the usual. “Please…I’ll pay you back,” he promised. No he wouldn’t. He never paid her back. She dug the money out of her shorts anyway and handed it to him. Nicky said nothing the remaining five-minute drive. It wasn’t as though it was far. But why should she have to walk or pay for a taxi when it was her car? She shouldn’t. She turned in the seat and glared at him. “I swear if you don’t answer my call tonight, Jonathan…it’s...I’ll…never let you take the car again,” she ground out. She wanted to say it was over. Wanted to assure him she would leave for real this time. For a second, Nicky thought he was actually going to show compassion. But as always, he turned everything around so she would feel guilty. She whipped the door open, hopped out, and slammed it behind her, refusing to turn around as Jonathan peeled out of the parking lot. Instead of letting his callous attitude bother her, she set out to do her job, pushing the tears back, as she’d done her entire life. She was barely through the door when the manager announced he’d opened her station and she had guests waiting. After grabbing her tray, she darted off in the correct direction. She knew where her station was. It was Saturday, so Gary would have put her upstairs. It was a challenge, but the good thing was…most of her customers wouldn’t sneak to the bar to order their drinks. She was fast and she was the best. She could remember fourteen drinks because that was the amount she could carry on her tray and in her hand. While other cocktail waitresses spent the evening flirting their way to larger tips, Nicky increased her sales, which augmented her tips. After all, fifteen percent of zero is zero. The night started out so busy, she hardly had a moment to lament over her mother, her father, or her worthless boyfriend. But as the evening progressed, belligerent customers she’d normally ignore started irritating her. One group in particular was getting on her last nerve. If that schmuck called her “toots” one more time, she may just throw her tray at him. “Hey, toots, you forgot my beer!” the obnoxious loser bellowed. Nicky inhaled deeply, attempting to control her emotions. “You didn’t order a beer, sir. I asked if anyone wanted anything, and you said, ‘no’. Would you like another beer?” She couldn’t help but notice how attractive the man was, but he wasn’t her type in the least. He exuded arrogance. She’d reached her limit. Nicky couldn’t take any more. She slammed her tray down, turned around on her heel, and headed for the stairs. The tears escaped again. Why had she thought she could work? Just because she hadn’t been close to her father in the last fourteen years didn’t mean she didn’t love him. She loved him more than any other person on earth. He was all she had. Trudging up to Gary, she handed him her checks and informed him she had to leave. He cocked his head and narrowed his eyes but was obviously so taken aback he couldn’t speak. Gary knew she was reliable; he knew that if she were leaving, there had to be a rational explanation. But she didn’t have the energy to explain without breaking down in front of him, and he definitely didn’t have time for that. Seeming to understand, he accepted her checks and entire apron full of money, minus a twenty she’d pulled out in case she had to call a taxi. “My tips are in there. I don’t have time to cash-out. Will you take care of it and put my money in the safe? I have to go.” With that, she turned and walked outside. She pulled out her cell and called Jonathan, knowing he wouldn’t answer. Unfortunately, she was correct. Sitting on the curb, her arms wrapped around her knees, she attempted to impede the tears. What good did they do anyway? Crying never solved anything. What was done was done; all the crying in the world would never alter her circumstances. Only she could transform her worthless existence. Cameron pulled into the beachside park and stopped his bike next to the crosswalk that led to the Atlantic. “Have you ever been here?” the waitress asked. Alexandra was a mystery. What in the world was she doing here with him, a complete stranger. She wasn’t his type at all; she was entirely out of his league in many ways. She was too pretty, too tall, too friendly. For being so tall, though, she sure had a knockout figure. She had to be five-eight or five-nine, but her body…she looked like a real-life Barbie doll. Her hair was golden blonde with soft curls, the kind of hair women spent a fortune to achieve, but hers looked natural. And it was long. Even pulled up it came halfway down her back. She sighed loudly and then turned her head back to the soft crashing waves hitting the beach in a consistent rhythm. This couldn’t be happening. The way she said his name sent a thrill through his body. He didn’t need this. She pulled her hand back and picked her drink up. He sat back down and watched as she sucked down the final sips of the Slurpee and then pulled the bottle of bourbon back out, pouring several shots into the second cherry-flavored drink. He definitely didn’t need this. He already had one problem at home. Alexandra turned to him, her eyes already glassy from the first drink, which was really more like four drinks. No way would she be able to hold onto him for a return ride to Merritt Island. She looked as though she would pass out at any minute. She leaned toward him. He could see what she wanted, and he wasn’t about to succumb. He didn’t need some scorned woman using him. She inched her body closer, obviously cold in her little outfit and downing a frozen drink. Instinctively, he wrapped his arm around her. She sighed, and he couldn’t help but feel the warmth emanating between them. She looked up at him and her lips were inches from his, smelling of cherry and sweet bourbon. He wanted this, too. No he didn’t, he tried to convince himself. Her eyes—glassy from drink or tears, he wasn’t sure—sparkled in the moonlight. The smell of the salty air mixed with her hair that smelled like coconut and the essence of smoke from the bar. The bouquet all converged with her scent to create a sensual aroma. He pulled her body closer, unable to restrain his impulse to kiss those full lips that would taste like cherry. She lifted her face to his, her lips slightly parted, inviting him in. He pressed his lips to hers and she reacted instantly. It was the alcohol he knew, the un-inhibiter, the aphrodisiac of all drugs. But she felt incredible. His mouth moved over hers, testing, experimenting. His tongue tasted her and he wanted more. He pulled back first; this was wrong. “Will you take me home?” Those blue eyes gazed up at him, making him believe she wanted him. He reminded himself it was just the alcohol. She had a boyfriend. She was out of his league. And he didn’t date. “Why?” Her voice was sultry, beautiful, causing his not-so-sensible self to doubt his words. “But who do you want to be with?” he retorted. His heart melted. He knew it wasn’t true. And yet, he didn’t know how to say, no. He stood up again, this time pulling her up beside him. Drawing her close, he wrapped his arms completely around her. She fit perfectly. Like no woman had ever fit before. He was tall, and he had always preferred shorter women, but Alexandra folded nicely into his arms. He merely had to tilt her head a fraction to kiss her. Their lips met again and liquid heat soared through his body. He didn’t want a one-night-stand. Was it possible that she could be the one? The one he’d bargained for? He hadn’t been with a woman in so long. He had enough troubles with the one he had at home. “I don’t want to go home, so, no,” she responded like a scorned child. He pulled her toward his bike, handed her the helmet, and then crossed his leg over the bike. Without a second’s hesitation, she hopped on behind him, wrapping her arms tighter around his waist, burying her head into his neck. His condo was only a block away. He would let her sleep this off and then take her home in the morning. Cameron pulled onto his drive and parked his bike directly outside his door. He had an end unit, so the neighbors didn’t complain. He keyed in his entry code and allowed her to enter first. Alexandra immediately went to the sliding-glass doors at the rear of the living room. “Wow. You live here alone?” She opened the door, allowing the salty air to whip through the house. “This is…incredible!” She stepped out onto the lanai that overlooked the Atlantic. “We didn’t need to go to Cherie Down; this is beautiful. Do you live by yourself?” she asked again. “Oh…what’s so funny about that? He didn’t want to get into what he did. Most women were bored anyway. He usually didn’t even admit that the condo was his. But for some reason, he wanted to impress Alexandra. As if it mattered. Tomorrow she’d be gone. She was still out of his league. He stood up. “I’ll go get you something to wear and sheets for the sofa.” He left her on the porch and walked back into the house. But after a second, he realized she was behind him. Ignoring her, he entered his bedroom. His room also overlooked the beachside. Alexandra followed him into his room and went directly to the sliders again. After opening them, she crawled up on his bed and stared toward the ocean, as if a million miles away lost in a distant dream. He pulled a large t-shirt out of his dresser, handed it to her, and then went into the bathroom to brush his teeth. A beautiful woman lie sprawled across his king-sized bed, and he was brushing his teeth. Never had he imagined when he ventured out with the guys after work that this is where his evening would end up. Should he sleep on the sofa? He didn’t even know this woman. He pulled an extra set of sheets out of the linen closet and headed toward his bedroom door. “To the sofa,” he replied. “Cameron, please don’t. Please come here,” she whispered. His heart pounded at the idea that she was someone else’s woman. “I can’t do that either.” It was stupid, but it’s what he called her, and he didn’t want her to think of anyone but him right now. He wondered what her boyfriend looked like. If she was Barbie, he was certainly Ken. What chance did he stand? He didn’t want a chance he insisted, but the voice was getting weaker. Alexandra scooted off the bed and crossed the room to where he was still standing, stupidly holding sheets so that he could sleep on the sofa in his own house. She pulled the sheets out of his hand and dropped them on the berber carpet. Lifting his hand, she drew him toward the bed. There was no way he was backing out. He knew this, and yet he knew he needed to stop. 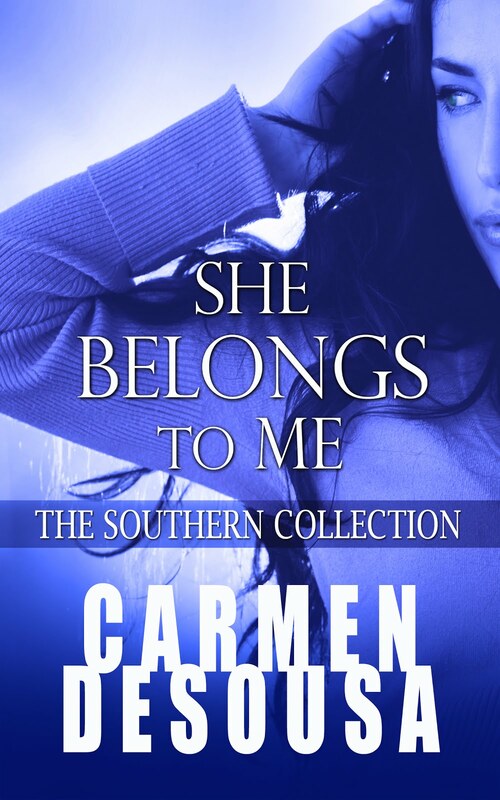 He shadowed her back to the bed, followed her body down to the mattress. He would be sorry tomorrow, but right now, she was his. Once again, his mouth captured hers, and it was all over. They spent the better part of the evening intertwined in each other’s arms. She was incredible. It had been so long. He had assured himself that he would never make love to a woman who wasn’t his wife ever again. But Alexandra was a goddess. Her beauty, her body, and her scent had all enraptured him. And tomorrow she would disappear, like a mirage, an imagined fantasy. The next morning arrived, and Cameron watched as Alexandra sprung from his bed, pulled on her clothes, and ran out of his room. He didn’t allow her to know that he was awake. She had been spooned up against him, her back toward him when he heard her gasp awake. The events of the previous evening penetrating her consciousness, no doubt. Now that she wasn’t drunk, she was certainly horror-struck about her actions and the fact she’d gone home with a stranger. He let her walk out the door. 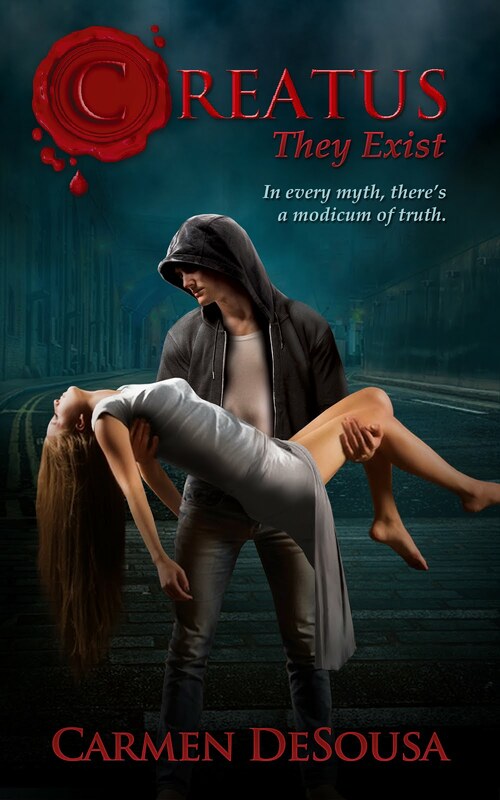 While I do not write "Christian" books, I do share my characters' Christian beliefs. My characters are real people who come with flaws, no perfect people allowed. The cover looks great and I can't wait to read more! The cover is amazing! There's nothing better than symbolism to catch a readers eye and make them wonder what the story that lies within will reveal. A broken fairy tale...how many women can attest to relating to this notion as a grown woman from the stories of their youth? I think you nailed it on the head! Congrats!